You can advertise your audio guides and monitor the effectiveness of those advertisements. You can do this by using techniques for monitoring advertisement campaigns. You can read more about the advertisement campaigns here. You can use posters advertising audio guides for different museums, flyers inviting people to visit a certain tour, etc. However, in order to monitor the effectiveness of such advertisements, you need to place a QR code with special markings on either the advertising medium or the website. Scanning such a QR code not only opens the advertised item’s web page but also saves the information that the person has come to the page after scanning the given QR code. As an example, let’s look at the making of a QR code for a poster advertising the audio guide which will be displayed in the museum’s lobby. Adding markings to the QR code for the poster. Open the museum properties and go to the QR Code section. 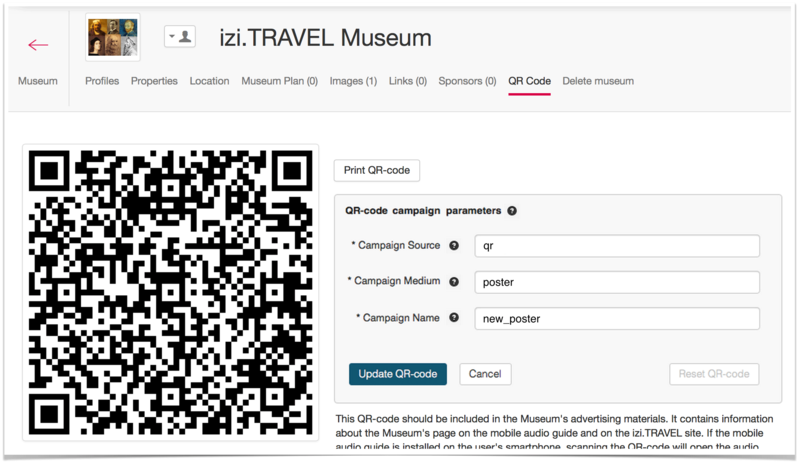 Click on “Add campaign parameters to QR-code”. 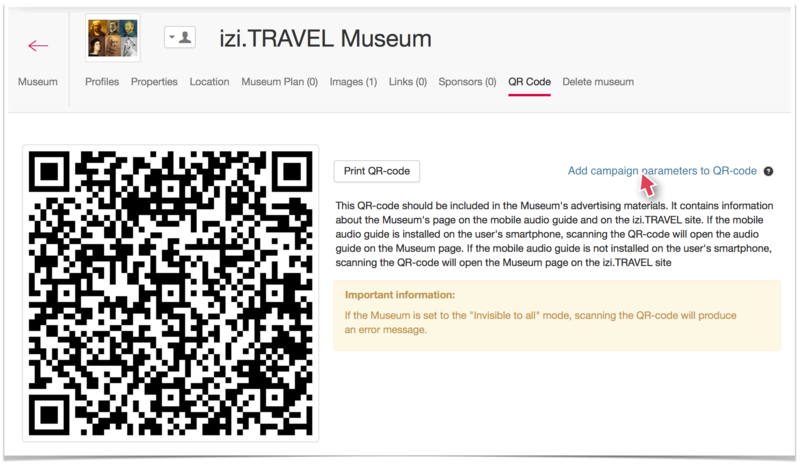 This will open the panel for adding the advertisement campaign parameters to the QR code. Enter the values for all parameters. Everything needs to be written in Latin characters without spaces. Campaign Source. For example, enter “qr” which will mean that a QR code is used as the source. Campaign Medium. In this case, we’re talking about the advertising medium on which the QR code is placed. Enter “poster” to indicate that the QR code is placed on the poster. Campaign name. This is the name which will be used to identify the frequency of using the QR code. Such as, new_poster. Then click “Update QR code”. A new QR code will be generated based on the input data. Also, the panel for adding advertisement campaign parameters will switch from edit mode to normal mode. Check the new QR code’s accuracy. To do that, scan it with the mobile app (QR scanner). This should open the museum’s page on the izi.TRAVEL website. The new QR code needs to be placed on the poster. To do this, save the QR code image in a file by right-clicking on it and selecting the prompt “Save image as…”. In the opened file manager, specify the file name and location. Use this image when designing the advertising poster in the graphics editor. Examples of advertising posters, flyers, and other materials available to view and download on the izi.TRAVEL website. 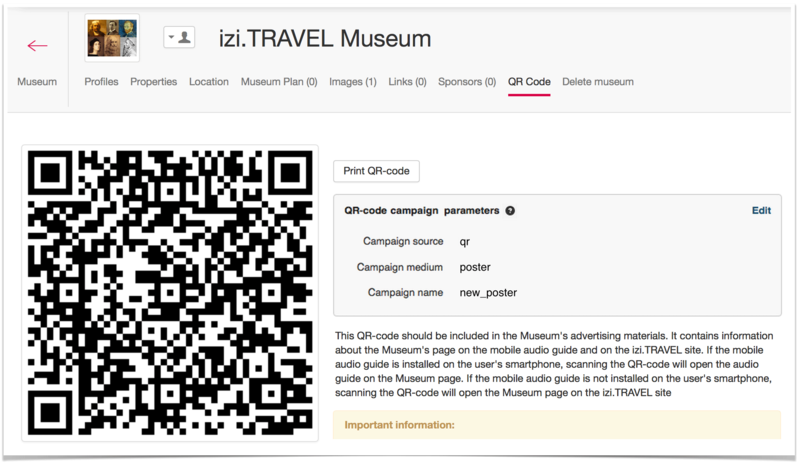 After the poster with the new QR code has been displayed in the museum lobby for a certain period of time, for example, a week, you can send an inquiry to izi.TRAVEL’s Customer Support. Your inquiry should specify the period for which you want to get statistics as well as the name you have entered in the “Campaign name” field.